Harmar's lineup of quality Micro Lift Systems makes transporting your micro or travel	mobility device a breeze. 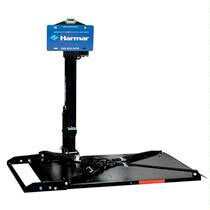 Designed to combine quality with budget, Harmar offers a solution for virtually every application. Compact in size and lightweight enough for even a Class I hitch, the AL010 Micro Scooter Lift lets you easily and securly transport virtually any 3 or 4-Wheel Travel Scooter or micro power chair. ts generous platform and adjustable rear wheel cradle make fitting the mobility device to this lift simple. The 4 secure tie-downs ensure stability and safety. Available with an optional Swing-Away for easy access to the cargo area.